Today: Orange you glad you didn't throw away that citrus peel? Jennifer Farley from Savory Simple shows us how to make the perfect, customizable holiday gift. I love giving out edible gifts over the holiday season; there’s something so comforting and timeless about a homemade present that you can’t put a price tag on. It may cost very little to make, but it feels much more personalized and heartfelt than something pricier. Candied orange peel is one of my favorite homemade holiday treats. I serve it at parties or seal it in a decorative jar and place it under the Christmas tree as a gift. It’s a crowd pleaser, easy to make at home, and very customizable. In fact, there’s a good chance you already have everything you need to make it right now. More: Dress up your homemade gifts with fancy trimmings. It does take a few hours to prepare this recipe, but you can break it up over two days. The orange peel needs to be blanched in water to remove bitterness and then simmered for a few hours in a simple syrup, which I like to do in the evening while watching a movie. Once the peel has been candied, let it dry overnight on a cooling rack and then toss it in granulated sugar the next morning. Sugar preserves the orange peel so that it will keep at room temperature in an airtight container for two weeks, but I can pretty much guarantee it won’t last that long -- these are very addictive. 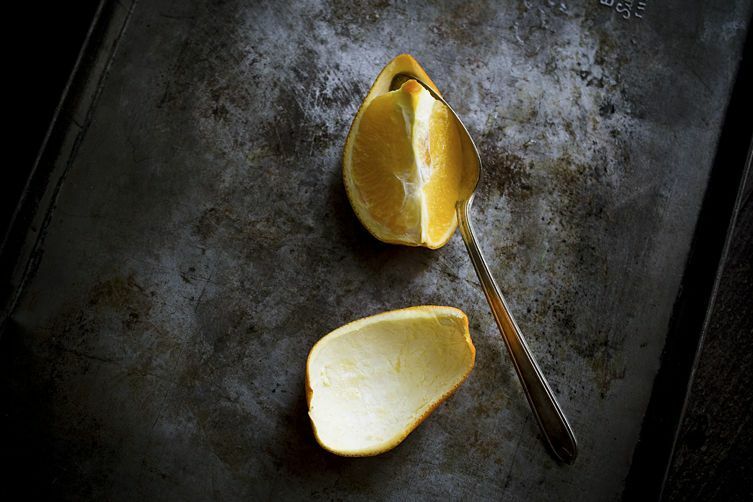 For variations, try swapping out the orange peel for another citrus, such as grapefruit or Meyer lemon. You can also dip the finished candied orange peel in melted bittersweet chocolate for a more decadent treat. Slice the orange into quarters. Use a large spoon to scoop out the fruit, but leave as much of the white pith attached to the peel as possible. 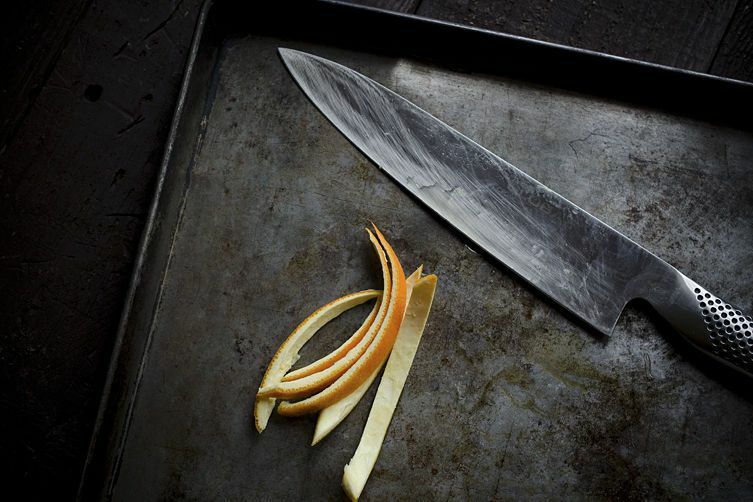 Use a sharp knife to slice the peel into thin slices. Place the orange peels in a large saucepan and cover with cold water. Bring to a boil and simmer for 3 minutes. Drain and repeat this process two more times, using fresh water each time. Clean the saucepan with soap and water. Add the water, sugar, and vanilla bean, if you're using it. Bring to a boil, stirring occasionally to dissolve the sugar. Reduce to a simmer and add the orange peels. Simmer on very low heat, stirring approximately every 25 minutes, until the peel becomes slightly translucent, 1 1/2 to 2 hours. Line a baking sheet with parchment paper and a cooling rack. Using tongs, remove the orange peels from the syrup, shake off any excess liquid, and move to the rack to finish draining. 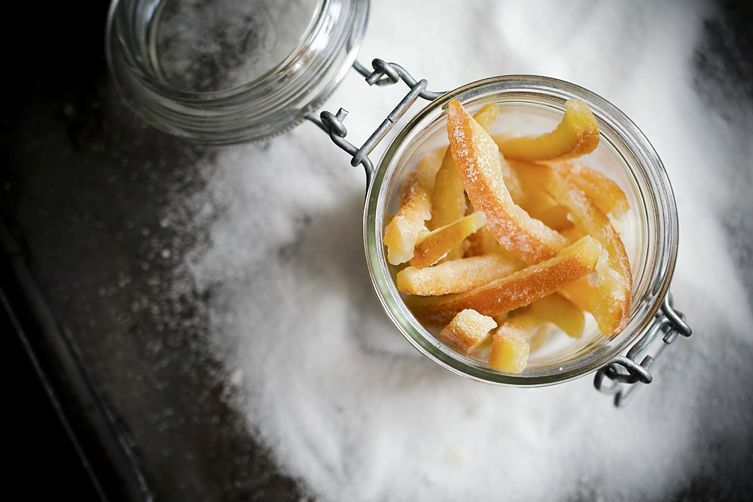 Allow the candied orange peels to dry overnight. Toss with sugar before serving. I'm a full time freelance recipe developer, food photographer and blogger living in Washington DC. I graduated in 2009 from the Culinary Arts program at L'Academie de Cuisine and have worked professionally as a pastry chef and cooking instructor. I recently published my first cookbook. My work has been featured by Williams-Sonoma, Bon Appetit, The Huffington Post, Marcus Sammuelsson and Cosmopolitan Magazine. Does this work with grapefruit? Hi, thank you for sharing your recipe! :) I just found the world of candied citrus and I really want to seal them in jars for gift on Valentine's day. My question is how can we seal the jars, without making the candy melt together during the jarring process? Thank you for your help! Hmm... honestly I don't think you can can them. The heat from the canning process would most likely melt them and the peel would attach to the jar (and not look as pretty). Perhaps it would be best to give them as gifts in decorative jars without actually sealing them? This is just gorgeous! 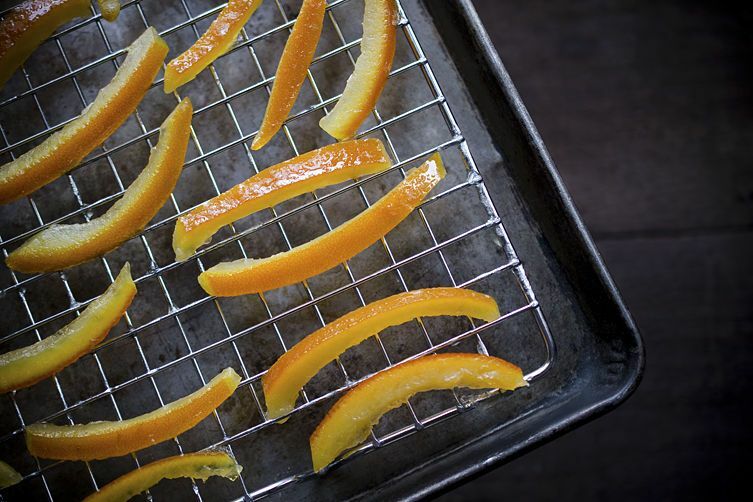 I LOVE candied orange peel..why haven't I tried making this? You've inspired me! Can't wait to do this! The left over syrup is good in black coffee. I don't eat a lot of oranges, so when I peel one, I cut the peel in long strips, and let it air dry completely. Then I put them, as they accumulate, in a zip loc bag. When I have enough to candy, they are quickly reconstituted in the first 3 rounds of boiling water. My favorite way to eat them is to dip them in Dark Chocolate, and I dip them after they have been candied. My friends love them. When I was a Pastry Chef, I used to take a long strip of candied Lemon Peel, tie it in a little knot, and garnish each rosette on top of a Lemon Cake. I always finished a dessert in a way so the wait staff knew where to cut the pies, cakes, etc. Each diner received a slice of Lemon Cake with a pretty rosette and a candied lemon peel knot on top of it. Any idea what sort of cocktails I could make with the leftover syrup? It's too delicious to discard. And I used heirloom navel oranges I found at the grocery store. The peel itself smelled spiced. I've often wondered the same thing- cocktails definitely aren't my specialty. Maybe someone else will chime in. One thing you can do with the syrup is whip it into a buttercream frosting recipe in place of some or all of the sugar called for by the recipe. I just substitute to taste and texture. How good does that sound on top of orange spiced cupcakes? I used the syrup in an old-fashioned this evening and I loved the citrus-y sweetness it added. Muddle the syrup, a maraschino cherry, a small orange slice (optional, since our syrup is orange-flavored), and a couple dashes of bitters in a glass. Add 2 oz of bourbon, a splash of water (or soda water), ice cubes, and stir. Thanks for the recipe! This is the first time I'll be making it but want to be sure about the pith - on or off? What are the benefits of having the pith as you stressed not to take it off. Want to be sure before putting in the labour. If you leave on the pith it will yield a thicker candied peel. It doesn't have to be perfect. More pith = more candy! That's a great tip. Thank you. Will be trying it this weekend. I'm thinking of using my slow cooker to do it. Every recipe I've seen for this requires taking all the pith off. I like that this one leaves it on! I am going to check it out over the break coming up! Thanks. I forgot to add that we have been doing this in my family since the mid 1970s. My grandmother had her own trees in central Texas protected by a greenhouse so we could enjoy satsumas picked fresh and then have peel all year long. 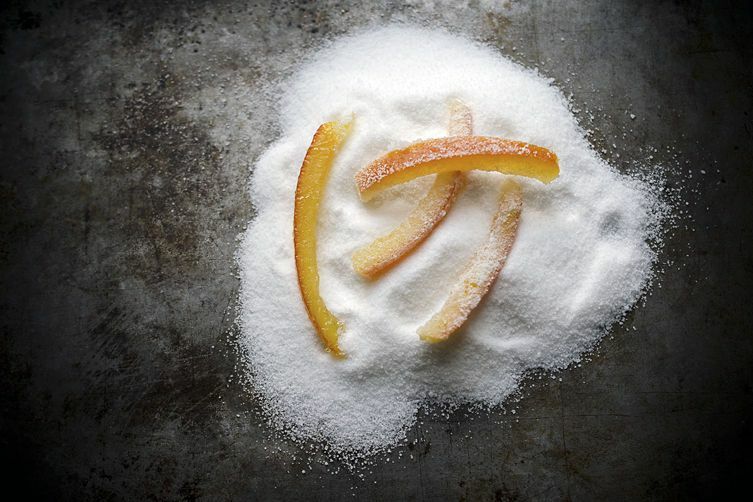 Candied satsuma peel is now a 4 generation tradition and has all the associated family memories to go with it. Miss my grandma this time of year when satsumas are in season. Try this with satsuma orange peel. You can only do the boil, drain thing once because the peel is considerably less bitter than regular oranges. Then put the resulting candied peel in zucchini rosemary orange bread, cranberry orange bread, topping for some smashed roasted sweet potatoes. And it freezes beautifully. What type of orange would work best? Navals? I always use whatever oranges are biggest and brightest at the grocery store! A bright orange peel will make beautiful candy. And don't whatever you do toss the syrup after you've poached the peel. It too has a lovely orange flavour and can be used on and in a variety of things to add orange flavour. I NEED this! thanks for the lovely recipe! I cover them in dark chocolate instead of dusting with sugar. So addictive. I am an obsessive citrus peel saver. 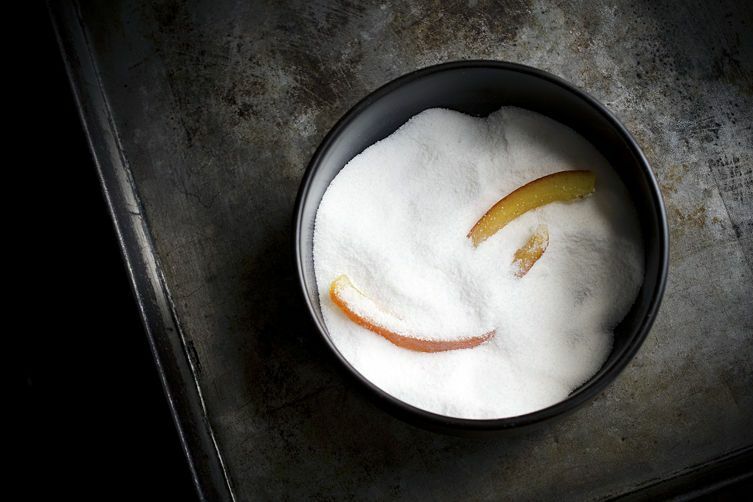 Candied orange peel--and grapefruit--are heavenly! I keep candied-but-not-sugared peel in the fridge in it's syrup so it's ready to dry and sugar at short notice. Lovely garnish for a pretty dessert. It has been far too long since I candied citrus peels. I made a whole bunch of them a couple years ago, gave away as many as I could, and still had a ton left over. So I ate them all. My poor teeth...they hurt so good.